Colorful Spanish Colonial in Historic Centro - Rave Reviews! A colorful Spanish colonial house located in the historic center of San Miguel (five flat blocks to the Jardin and one block to the Mercado). Indoor/outdoor living with lots of patios; lovely large courtyard/garden and fountain; roof-top terraces and expansive upper-level sala (outdoor living room) that includes wood-burning fireplace and counters with built-in gas barbeque, sink and fridge, perfect for entertaining upstairs. The large indoor living room/dining room has four-meter-high beamed ceilings and a large gas fireplace. Opens to kitchen and courtyard on two sides, and a private reading room on the third. The large colorful light-filled kitchen has local tiles and high-end G.E. appliances and dishwasher. Pressurized water filtration system throughout the house. Very high-speed fiber optic Wi-Fi Internet available throughout. The 26' X 16' master bedroom (California king-size bed) has its own bathroom en suite, fireplace, and a sitting area. It overlooks the courtyard, fountain and outdoor sala. The second bedroom (queen-size bed) has its own fireplace, bathroom/dressing room en suite, and sitting area. The third bedroom (queen-size bed) has its bathroom/dressing room en suite, as well as a sitting area. Maid and gardener service is included MWF. Please, no Smoking in the house. Gas fireplaces and electric heaters. 3 gas fireplaces -- in living room, master bedroom and second bedroom. Very high-speed fiber-optic wi-fi broadband throughout the house. G.E. Profile Side-By-Side. In-Door Water & Ice Dispenser -- highly purified water from reverse-osmosis system dedicated to refrigerator. Large kitchen with high end appliances -- G.E. stove/oven, refrigerator, microwave and dishwasher. Cable TV service: Major U.S. channels and variety of Spanish-speaking channels. 2 DVD players -- 1 for Mexican zone and one for USA zone DVDs. Very large upstairs sala and outdoor space with seating, fireplace, gas BBQ, small refrigerator and sink. Three gas fireplaces, Phones, Bottled water available. Firewood can be ordered at renter's expense for sala fireplace. San Migel de Allende is a world heritage site and rightly so. It is a vibrant, colourful, historic and friendly city that is one of most economical vacation cities in the Americas. The local people are most hospitable, always eager to speak and help in any way. A car is not necessary as buses travel everywhere for very little fare and taxis are in abundance (some 375 in the city). Casa Madelan is very centrally located, north of the Jardin a few steps. The mercado (market) is two blocks away, a bountiful source for fruit, vegetables, flowers and meat. The house manager Erika was here to meet us on arrival and showed us around the house and has been most helpful for the month with her excellent command of English and all of San Miguel. Margarita the maid is very thorough and kept the house immaculate along with the gardener. The house is large, the master bedroom as big as some apartments in Anglo cities, with an enormous comfortable bed. On entering you are greeted with a large open area and the various rooms are to one side or upstairs off the large open deck. The casa sports a well equipped Mexican kitchen, ensuite bathrooms for each of the three bedrooms, filtered, safe water throughout and lots of hot water for the showers (a plus in some homes here). While we stayed TelMex installed an upgraded wi-fi modem which greatly improved download speeds etc. There are 4 gas fireplaces strategically placed in the home, which we had to use on occasion due to the extraordinary weather here this year. We had rain, and hail and there was snow in the mountains for a day or two, the first time in 35 years or so (El Nino?). In short Casa Madelan met and exceeded our expectations, and in no small measure contributed to another great vacation in a truly remarkable city and country. The owner has been most gracious, attentive and easily approachable, responding quickly to any correspondence, thank you Alan. A group of adults (siblings and their spouses) spent two weeks at Casa Madelan in January 2015. This was our first visit to San Miguel and we were delighted. It was warm and sunny during the day, though cooler at night. I agree with all the comments of others about Casa Madeleine. It is a lovely house, very comfortable, and quickly comes to feel like "home". We particularly enjoyed lounging on the second level terrace in the afternoons -- it is the perfect place for reading or napping! We typically cooked breakfast at the house and had dinner at home several times. The kitchen is large and very functional, and the large dining room is very pleasant. Casa Madelan is very well located. It is away from the Jardin and busier parts of San Miguel but close enough for easy walking everywhere. The house is about two blocks from the fruit and vegetable market and the associated meat and chicken butchers -- great fresh produce and meat! It is an easy, flat walk from the house to the Jardin and the other principal sights of San Miguel. The property manager, Erika, is extremely pleasant and helpful. Besides helping with questions about the house, Erika helped arrange several tours for us to nearby historic sights. It is also very pleasant to communicate with the property owner, Alan, who is prompt in responding to any questions. We recently spent a wonderful month in San Miguel de Allende based at the wonderful Casa Madelan. The city was exciting, busy, colourful and full of festivities and activities. The house by contrast was an oasis of peace and quiet and gracious indoor/outdoor living. Home owners Alan and Madeline have thought of everything. Three ensuite bedrooms with spaces to sit and read or write and rest ensured we and our guests were happily ensconced in our own comfortable digs. The shared spaces such as the beautiful central courtyard with lush vines and plants and fountain, the rooftop sala with ample seating and BBQ and satellite kitchen area, and the beautifully decorated and comfortable living room / dining room made communal gatherings a joy. At any point in the day we could choose between a lovely patch of sun or cool comfortable shade outside. The interior was beautifully lit with large windows letting in natural indirect light; and lots of thoughtfully designed interior and exterior lighting made every space beautiful and comfortable day and night. The main kitchen was well equipped and easy to work in and shopping at nearby markets, bakeries, butchers and grocers for fresh local ingredients for our meals was really fun. We also had a great time discovering local restaurants and cafes. We were walking distance to everything in the centro historico area and much beyond. When we tuckered out or it was getting late we just jumped into a taxi. We took in films, museums, concerts, markets, galleries and studios, and even took part in local volunteer activities. The neighborhood felt comfortable and safe and we enjoyed meeting the family who ran a little shop steps from our door where we bought water and anything we were running short of. The property manager Erika was very warm and helpful and it was great to know she was there when we needed her. Margarita came three times a week to clean and take care of the garden. She was very pleasant, efficient and thorough. Allan and Madeline’s passion for great design and comfort and for the magic of SMA was evident in every communication. Our San Miguel holiday was a perfect mix of activity and rest. Our stay at Casa Madelan was nothing short of wonderful! We felt extremely well taken care of and soul nurtured by all involved including San Miguel de Allende. We would love to return! This is an exceptional property! The owners are terrific to work with, the property is well maintained, clean, and there are many places where the sun comes shining in (many places in San Miguel are much darker). All the amenities are furnished, Margarita comes 3 times a week to clean and garden, and if you pay her extra, she will do your laundry for you. Erika, the casa manager is absolutely wonderful to work with and handles any questions or problems speedily and with ease. The location of the property is just perfect--2 blocks from the Artisian Market and the fruit and vegetable market, close to Plaza Civica (3 blocks) where many events go on, about 5-6 blocks from the Jardin where something great is often going on or you can just sit & read there. There are many opportunities through the Bibliotecca for films, lectures, discussions, plays, etc. & it is only about 6 blocks. Nearly everything you need is really close, & there is a Bonanza Grocery store and other small markets, so you never have to go to a mega store. You can walk every place, but taxis in town are just 30 pesos wherever you go--more if you call them to your home so we usually walk a couple blocks to catch a taxi, but we rarely needed a taxi. You get 100 free calls from the phone at the casa, and we didn't use that many. There is no Vonage phone to make free calls, but we set up Skype before we came down, and it worked fine. We brought a laptop and a IPAD and had no problem with either one. The house is very large with a beautiful outside courtyard open to the sky when you come in. There is a deck upstairs with a partially covered patio with a grill, fridge, etc. & chairs. There are beautiful plants & flowers everywhere plus a fountain. We had some cooler weather this year, & there is a gas fireplace in the living room as well as in two of the bedrooms, to take the chill off. There is a small office space with nice light coming into it that was perfect. There is a large dining room table with 6 chairs & 2 candlelabras, and there are other candles in the house to enhance the mood. There are beautiful rugs, artwork, & Mexican decor. There are 3 full baths. I cannot say enough about the light pouring into the home--not so much it makes you too warm, but so lovely to wake up to and enjoy during the day. Everyone who visited us just raved about this casa. Also, there are so many GREAT restaurants in San Miguel. We stayed 2 months & loved our stay here & at this casa. In August of 2009 we rented this home for a week. The home is awesome. The pictures are exactly what it looks like, they are not misleading if anything they do not do it justice. There were seven in our party who rented the house. From the floor plan it appears like the bathroom off of the 2nd bedroom with the queen bed is accessable from the court yard however it is not. So anyone sleeping in the room with two single beds has to use one of the other rooms bathroom. This was not a problem for us we didn't mind sharing. Every part of the house is charming and very well decorated. The only negative comment about the house that I could make was the bedroom with the double bed has an attached bathroom which is very cute but the water pressure in the shower was seriously lacking. This may be a problem that has be addressed but we ultimately chose to use one of the other two showers in the house. The home is located in a great area, it is really close to the vegetable market and artisians market. The Jardin is a short walk away. The home has compiled a book of restaurants, markets, shopping, travel guides, etc. and we found it very helpful. All the places we tried that they recommended were excellent. The house manager and maid were both very helpful and informative. I had never heard of San Miguel de Allende before coming on this trip. The people are kind and helpful and the culture is so warm. I felt very safe, if fact one day I went out shopping for the entire day alone. There are so many places to visit within a hour drive however I would recommend using a tour guide. The service recommended by the house was excellent. We went on a tour of four other towns as well as horseback riding in the mountains through this service and every experience was wonderful. I would definitely come back and rent this home again. Casa Madelan is one of the best houses I have rented in my many years of travel in Europe and Asia. I'd give it a five-star rating, putting it right up there with some of the wonderful places I've been lucky enough to stay in in the Umbrian countryside. Classic Mexican colonial architecture, simple, exquisite taste in the layout, wall colors and textures, and furnishings, and all the comforts of home -- all on a wonderful street close to everything. This place is juicy in all the right ways -- friendly Mexicans live all around you; you're not isolated in some trying-too-hard hotel or tourist enclave. As I relaxed in the incredibly comfortable and huge master bed, I was delighted to hear roosters crowing, birds singing, and church bells ringing at all hours. After some long and sometimes over-stuffed and over-stimulating days running around San Miguel and the surrounding towns, my family and I would come back to Casa Madelan, open the front door and step into the courtyard, and breathe a huge sigh of relief-- we felt instantly relaxed and safe. 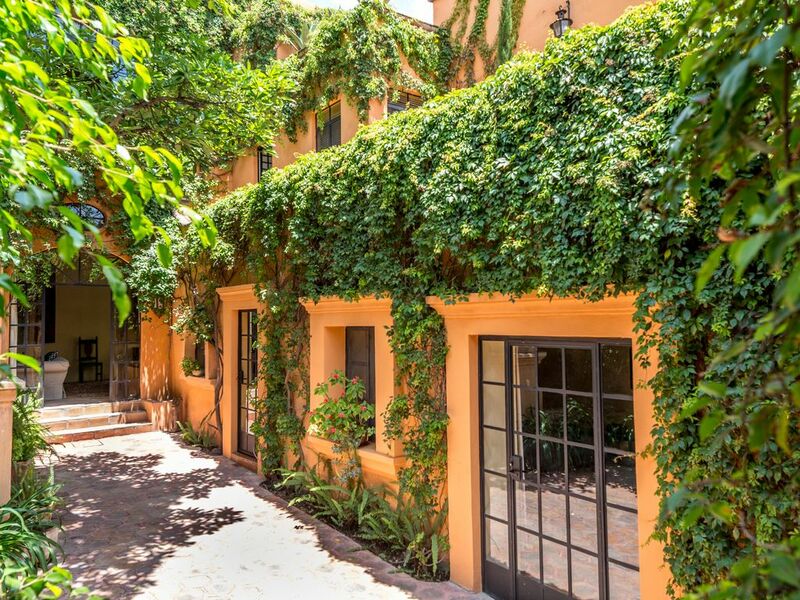 On the Spanish/Mediterranean model, Casa Madelan provides a cloistered world unto itself. As I write this, I am picturing the lovely fountain gurgling in the garden at the center of the house and the play of the water and light making shadows on the patio and walls as night falls. Fireplaces in almost every room are an especially nice touch, particularly in December and January, when it's a bit chilly at night. Alan and Madeline have thought of every detail; the bathrooms and closets, for example, are great. I should add that Casa Madelan is also a terrific value. There were just four of us this time, and we used only part of the house. But it was clear to use that several families could use the house very comfortably and still have lots of privacy. The house is spacious and well-laid out. I agree with other guests posting comments that the house staff --Maria the maid, Erika the manager, and Ricardo the gardener -- are a great addition. They are sweet people and excellent at their jobs. We had several minor emergencies during our stay, and Erika was patient and helpful throughout. I will be telling my friends about this place and hope very much to return myself soon. This house is a very, very special find. Art Institute, thermal spas, colonial treasures, etc. etc., -- but you know that already -- that's why you're coming to San Miguel!